Reasonably priced mobile organizers that can simplify storage needs. * Perfect for home studio office or shop use. 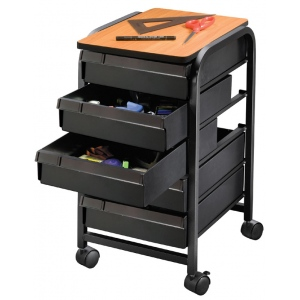 * Unit is built with a strong black metal body frame holding five rigid plastic drawers 16"l x 11½"w x 3½"d.
* Top of unit is made from pressed wood with PVC laminate surface and edge trim. 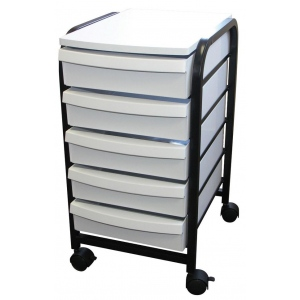 * Unit is equipped with four hooded casters two of which are locking. * Overall dimensions with casters: 13¾"w x 17¼"d x 25½"h.
The size is 13 3/4"d x 17 1/4"w x 25 1/2"h.